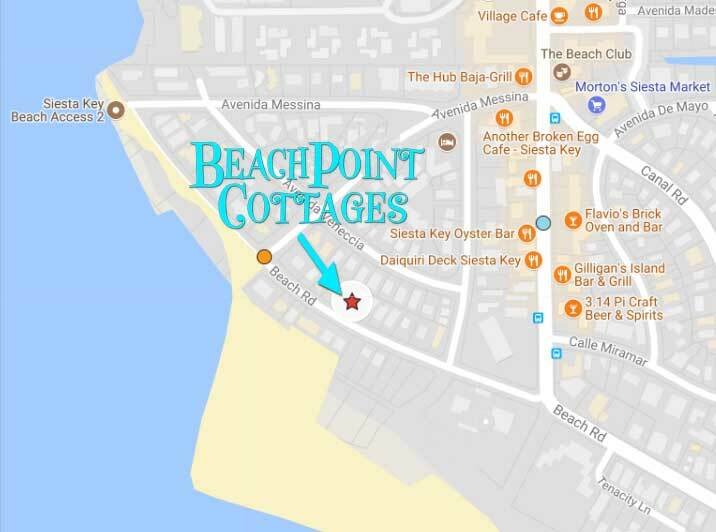 Frequently Asked Questions about BeachPoint Cottages and Siesta Key Florida. 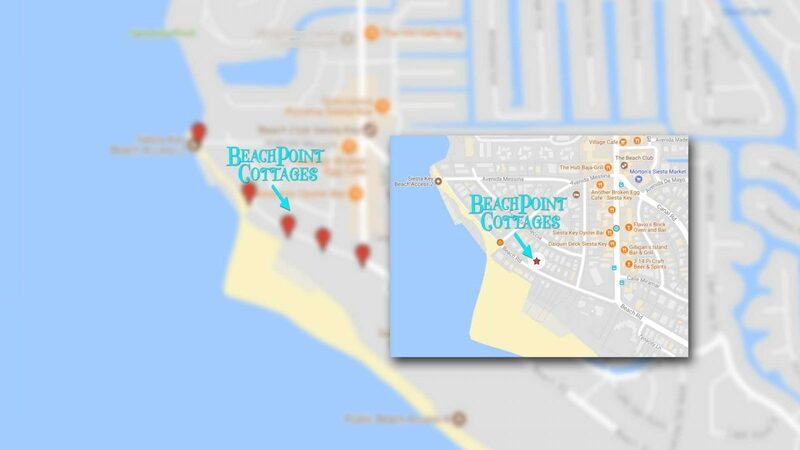 How close is BeachPoint to Siesta beach? Beach Access 3B is just 62 feet from our front door across a quiet back street. We are right by the beautiful white sand of our world class Siesta Beach. 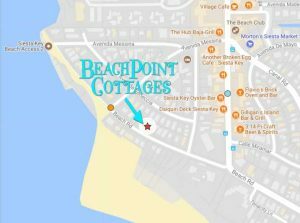 BeachPoint Cottages is so close to 5 different beach access points that you wouldn’t even consider using a car or even a bike! See a drone view of our property and the beach. Getting to the beach or the village is so easy and fast! No driving, no searching for parking and no sitting in traffic. BeachPoint has the very best location on the key. How close is Siesta Village? Siesta Village is less than a 5 minute stroll from BeachPoint. Our little village has a tropical, laid back vibe with numerous locally owned restaurants and pubs. You’ll also find clothing and jewelry stores, gift stores, a grocery and a drug store and a variety of hair and day spas. At night, many bars offer live music and most shops are open late during season, so there’s something for everyone on Siesta Key. What’s the best airport to fly into Siesta Key? You can fly into any of half a dozen airports near Siesta Key. Will I need a car on Siesta Key? We have free parking for guests if you bring a car, but if you plan to stay on the key – you really won’t need one. And you can always Uber or Lyft into Sarasota for day trips. If you want to do some island sight seeing, there are numerous free-ride taxi services that will take you all over the island for tips only. We also have a 7 day a week free open air trolley that will take you from the village to the south end at Turtle Beach. Is there plenty of parking at BeachPoint? Yes, we have free off-street parking for one car per cottage for our guests. By the way, if you want to ride around on the key, you really won’t need your car. We have a free trolley service that runs 10am-10pm 7 days a week and there are numerous free ride (tips only) services on the key. You really don’t need a car when you stay at BeachPoint! How is the weather on Siesta Key? You’ll often hear locals greet one another with “just another day in paradise”. It’s true, Siesta Key has magnificent tropical weather. Mild winter days and tropical breezes. Check your favorite weather site online for details. What will be supplied in my cottage? Kitchens with coffee maker, microwave, refrigerator, stove (hotplate in #4), dishes, cookware, etc. What should I bring to take to the beach? BeachPoint provides free beach carts, chairs, toys and sports equipment for you to use while staying at here! No surprise fees! And when you’re on the beach, you’re close enough to make a quick trip back to your cottage for food, drinks, ice and other necessities. Yes, we have free wifi for our guests. Just ask us for the password when you arrive.